Procurement is the way governments purchase goods and services from businesses. Governments use roughly 1 of every 3 budget dollars to buy things. With such large sums of money at stake, there’s obvious risk of abuse and corruption. Purchasing policies were created with good intentions: to ensure that government employees spend taxpayer money in a way that is ethical, fair and competitive, and accountable to the public. A key theme that emerged in our interviews with over 200 local public procurement stakeholders is that policy, while well-intended, is one major source of pain for procurement teams, government staff, and vendors. 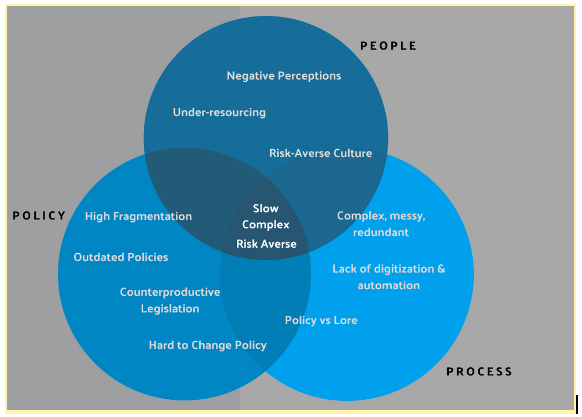 What makes policy so painful for individuals in government and business trying to navigate procurement? And how can we address some of these policy challenges? Procurement policies exist at the federal, state, and local levels, but procurement rules and regulations are often quite different from one jurisdiction to the next. For example, San Francisco has different regulations from Oakland, San Jose, and the many other cities that makeup the Bay Area. This means that government staff and vendors must navigate regulations in each jurisdiction, and that knowledge of one jurisdiction’s specific regulations is not readily transferable another’s. Navigating the specifics of regulations is cumbersome both for government staff as well as for vendors, especially newer participants. In addition, procurement code in a single jurisdiction lives in different places, which makes finding and reviewing these rules challenging. For instance, the rules that govern San Jose’s purchasing stretch cross the City’s Municipal Code, the City’s Council Policy Manual, City Council Policy, and the City Administrative Policy Manual, making it increasingly hard for government staff, especially newer staff members, and newer vendors to access, refer to, and interpret these regulations. Procurement rules and regulations are often outdated. Antiquated regulations constrain purchases and can be especially cumbersome when it comes to buying things like software as a service. For example, Philadelphia is finally reforming their procurement regulations; the last time the City updated these rules was over 60 years ago, in 1951. This is not uncommon. As one Chief Information Officer of a large city shared, “procurement for technology falls under code that was written more than twenty years ago.” In interviews, we heard similar feedback from government staff and vendors about the pain of navigating rules that are decades old. Procurement policies are sometimes counterproductive. Other policies may again be well-intended, but not necessarily achieve the goals they set out to achieve. For instance, San Francisco’s template Request for Proposals language specifies that “the City’s data, and the Contractor’s data center storing such data, must be located and remain in within the United States.” Rules like this one are intended to safeguard data, but may not reflect deep understanding of what is required to protect it. (Is data really “safe” just because it is stored in the United States? Not necessarily.) Other times, rules like these are sometimes created to ease compliance with federal-level regulations (for instance, federal requirements related to HIPPA data storage); but they may not be necessary in every case. Requirements like this one present barriers to entry for companies of all sizes; for instance, enterprise software companies like Stripe, Lever, and others create great products that could be relevant for local governments, but they are unlikely to adjust their data storage to accommodate government requirements. Interviewees noted that policy reform is typically a task for elected officials. However, most elected officials have little appetite for taking on public procurement reform and instead prefer more visible, quick-wins. A former statewide officeholder shared that he was twice talked out of taking on procurement reform by his advisors. To decrease the policy-related pains of procurement, governments should update, simplify, and standardize procurement policies. Governments can and should seek philanthropic and academic partners in this work, especially to add capacity in making sure policy changes have the intended consequences. There are some bright spots already. A handful of local governments are working on procurement reform as part of the Living Cities Accelerator. These cities are especially focused on interventions that help small, local, and disadvantaged business enterprises access city business. Still other local governments have worked with Harvard University’s Government Performance Lab, which provides technical assistance on procurement projects and prompted cities like Little Rock, Arkansas to implement policy updates. A government procurement scorecard: Civic tech veteran Abhi Nemani’s idea, based on the growth of open data and the open data census, is to encourage a “race to the top” for procurement reform by developing a scorecard that local governments can use to make small, important policy changes to procurement code. A “Uniform Commercial Code” for procurement: Many governments expressed interest in updating procurement regulations but expressed concern about capacity for change. There is benefit to government collaborating and adopting shared regulations. Recognizing that there are benefits to commerce from standardization of legal code, the Uniform Commercial Code (UCC) was created by the National Conference of Commissioners on Uniform State Laws and the American Law Institute to help offer a template set of laws for governing commercial transactions. These transactions include borrowing money, leases, contracts, and the sale of goods. The UCC is not a federal law. Instead, external organizations developed the UCC, and state governments can adopt UCC verbatim or modify it. Simplified policy navigation: Some cities, like the City of San Francisco, are using technology to help government staff navigate rules and regulations. San Francisco’s new procurement chatbot, PAIGE, helps government staff readily access the City’s purchasing regulations and resources and answers questions about procurement policies for staff. Similarly, the idea of a Common Application could simplify the experience of navigating vendor registration and bid submission policies of each and every local government. Policy is just one of the three Ps that contributes to the pain government staff and vendors experience around purchasing. In the next series, we’ll explore the second category of pain: people.